Updated: removed reference to contract. Verizon Wireless has added two refreshed LG handsets to its lineup of inexpensive phones. 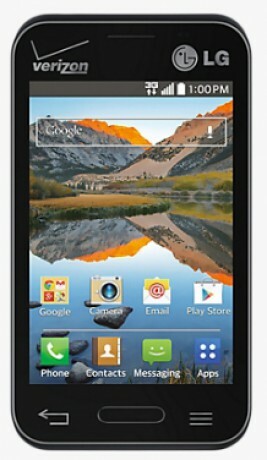 The LG Optimus Zone 2 and Extravert 2 are both sequels that improve specs and features. They are limited to Verizon's 3G network, as neither supports LTE 4G. Zone 2: This entry-level smartphone (pictured) runs Android 4.4.2 KitKat and includes a 3.5-inch screen with 480 x 320 pixels, 1.2GHz dual-core processor, 3-megapixel camera, 1,700mAh battery, Wi-Fi, GPS, and Bluetooth 4.0. Some of LG's software and apps are aboard, including QuickMemo and Guest Mode. The full retail price is $200, but Verizon is offering the device for just $50. Extravert 2: This updated feature phone is a sideways slider that includes a touch screen on the front and a full QWERTY keyboard underneath. It has a 3.2-inch display with 400 x 240 pixels and LG's touch-based user interface for feature phones. Other features include a 2-megapixel camera with video capture, Bluetooth 3.0, media apps, Verizon content, and the Opera Mini web browser. The Extravert 2 costs $200 with no contract, $80 with a two-year agreement, or $8.33 per month with Verizon Edge. Both phones are available from Verizon's web site. Sony Mobile today unveiled the Xperia XA2 and Xperia XA2 Ultra handsets, dramatically improved sequels to last year's phones. The XA2 and XA2 Ultra (pictured) have metal frames, new aluminum back panels, and 2.5D curved glass on front that Sony says is more refined than the previous generation. I am annoyed by this. The LG Optimus Zone 2 is only available on prepay service and not on a Two Year plan. OMG...I need my eyesight checked. For a minute there, I thought you typed p?#$y service....LMAO.